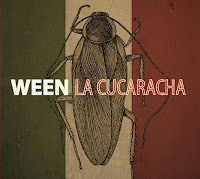 Laid Off Loser: Laid Off Loser Album of the Day: "La Cucaracha"
You never know when Ween is being serious with one of their genre explorations, but the light-rock "Your Party," complete with smooth-jazz saxophone from cheeseball alto sax blower David Sanborn, is seriously hilarious. The lyrics are even better. Happy Friday. Hope your weekend lightly rocks. I think "hope your weekend lightly rocks" should be the sign-off of a mustachioed commentator. (By the way, the online dictionary's sample sentence for the word 'mustachioed' is: "a veritable incarnation of the fierce soul." Can you grow one and get a cable slot?